Live Course Hours: PM only: 5:30 p.m. – 9:40 p.m.
Video Course Hours: AM classes: 9:00 a.m. – 1:10 p.m.
February 2019 Full Bar Review – LIVE classes begin December 21. February 2019 Full Bar Review – VIDEO & ONLINE classes begin December 27. February 2019 Concentrated Review – begins November 18. March 2019 MPRE – LIVE class will be held, Saturday, March 2 at New York Law School from 9-5. March 2019 MPRE – ONLINE class will be available Monday, March 4th. November 2018 MPRE – LIVE class will be held, Saturday, October 13th at New York Law School from 9-5 in room W401. November 2018 MPRE – Online class will be available Monday, October 15th. July 2019 Full Bar Review – LIVE classes begin May 20. 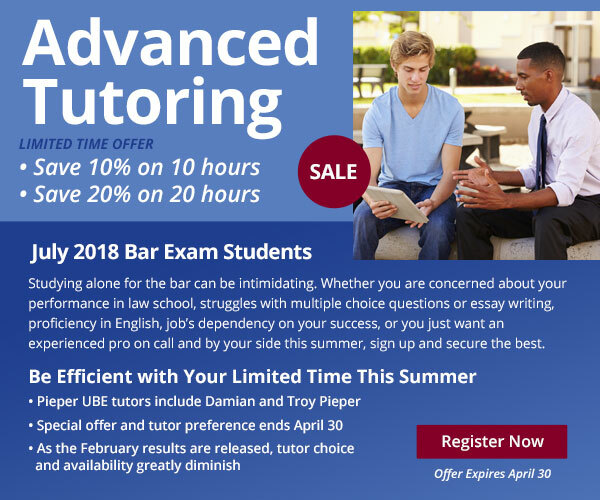 July 2019 Full Bar Review – VIDEO & ONLINE classes begin May 23. Our live class is offered at the New York Law School in New York City for both the July and February bar exams. This is where our core material is presented and recorded. All full bar review students have access to the digital iPass lessons, videos, and quizzes. The course work and lectures are recorded live at New York Law School, and made available digitally for review at your convenience. Teachers and administrators communicate directly with students through the iPass environment, and are available for additional help and tutoring. July classes begin in mid-May; February classes begin in mid-December. Video classes are offered at various locations throughout New York State. Here the recorded live material is presented in a classroom for Pieper students to review.